Artisanal recipes are considered to be primary sources in the historical study of artistic practices and materials. Prominent examples of such documents include the De diversis artibus attributed to Theophilus and the Libro dell’arte by Cennino Cennini. However, hundreds of other such examples exist and were still largely unknown. 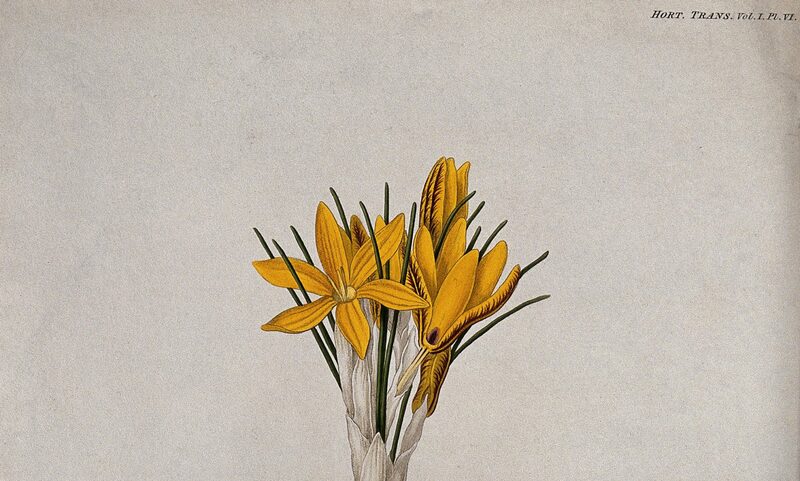 In his 2001 publication The Art of All Colours, Mark Clarke compiled an inventory of 400 source documents, dating from the production of the first artists’ recipe collections up to 1500. Since then, dozens of other surviving writings containing artisanal recipes have been discovered. Many more recipes were written down in manuscript and print in the period after 1500. 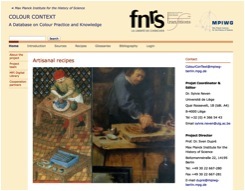 The initial goal of the Colour ConText database is to facilitate the consultation and exploitation of a large corpus of recipes. 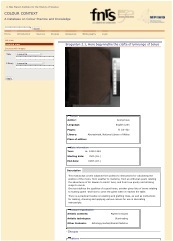 The core data consists of medieval and early modern manuscripts and printed books. To date, more than 500 sources (including manuscripts and printed texts) have been entered into the database, specifically located on the ‘Sources‘ page (fig. 2). In the ‘List view’, the entries are tabulated optionally by place of conservation or edition, or by title, author or date. 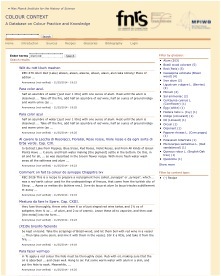 Detailed information such as the source’s title, language, location, provenance and circulation of these manuscripts and books (place and date of origin/publication), scribes or authors, previous owners, and a description of their technical and/or general content can all be viewed on this first interface, on the ‘detailed view’. From now, these sources can be searched by title, or by place of conservation or edition.The database also allows access to digital images of these sources via European Cultural Heritage Online (ECHO), or via digital collections made available by external institutes. The database also makes the content of the recipe collections accessible at the level of the individual recipes. To date, more than 6,500 recipes—some consisting of only a few lines, others covering several folios—have been transcribed and recorded on another specific page within the database. The ‘Recipes‘ page allows users to consult the transcription of a particular recipe, and sometimes also provides an English translation. This translation may either have been done in the framework of this project or be reproduced directly from existing edition. In such a case references to secondary sources, together with the related bibliographical data, are specified. Finally, this layout also gives access to the specific image of the original recipe text (fig. 3). Users can search for a specific request by library, source, title or ID number—a consecutive and unique number assigned to each individual source. It is also possible to search for specific words that appear either in the transcription or the translation of the recipe. Thanks to subject classification, keywords can be used when researching specific recipes, methods or materials. The general search button – situated on top of each page – allow users to combine an ingredient with a specific technique, mentioned in a limited geographical/chronological framework, when making their search. For example, the combined search for ‘alum’ (an potassium aluminium sulphate notably used in the art of dyeing and for the producing of lake pigment) and the colour ‘red’ shows a number of entries, which can be further filtered by glossary, artistic technique or content type. We can read that 305 recipes are concerned with the substance alum and with the production of the colour red. These recipes are more specifically related to painting, illuminating, writing, dyeing, gilding and metalwork (fig. 4). The Colour Context database can also help to identify specific, datable practices and materials. For example, we have observed that a significant number of procedures involving anthocyanin colourants (obtained from the juice of flowers and berries, such as poppies, cornflowers or blueberries) are specifically described within a certain group of manuscripts. More precisely these texts were written in the south of Germany and the north of France between 1400 and 1560. The database also includes a complete list of the ingredients and substances mentioned in the recipes, indexed both by their current scientific name (‘Current names’) and by the ‘historical’ terms precisely as they are written in the source texts (‘Historical names’). Objects and materials are linked by relational tables that allow the retrieval of all the different historical names used for one particular material—detailing the historical written context—as well as enabling the user to see the various materials that may be related to a specific name. These lists notably shed light on the diversity of colour names and the complexity of the varied colour terminology used in artisanal recipes. For example, the puzzling denomination ‘red of Paris’ relates to several different substances. In the Illuminier Buch von Valentin Boltz von Ruffach (first edition dated of 1549), it is used to designate a red pigment obtained from brazil wood (Caesalpinia sappan Linn. or Caesalpinia echinata Lamarck). However, other sources make a distinction between Paris red and the red pigment obtained from brazil wood by recommending the use of either the former substance or the latter (‘Ein guot röselin oder pfirsÿg bluot Nu nim presilgen oder paris rot’, Colmarer Kunstbuch, pp. 124-125, recipe 35). In Heidelberg, Cod. Pal. Germ. 489 , ‘Paris rot’ is a colour made from brazil wood and an unspecified lake called ‘Lacta’. Within this same manuscript, recipe  describes the preparation of ‘Rotenn Paris’ from a lake. It has therefore been hypothesized that this appellation was used as a way to distinguish a specific hue. For more information on the Colour ConText database, see my recent MPIWG feature story, Colours and Their Context.